A mountain of perfectly peaked meringue sits atop a decadent chocolate-orange pudding pie. The flipped meringue cookies gave me new confidence with meringue. I felt ready to attempt a meringue pie. Luckily, there is still plenty of chocolate in our ever diminishing pantry. Since friends were coming to dinner, it was the perfect day to attempt this culinary feat. I read many recipes on many sites. I was warned about weeping meringue and problems with humidity. Winter air in the Arctic is like air in the driest desert and I wasn’t scared off by a few tears from frothy egg whites. I was ready for the challenge. The process of making the pie was long and satisfying. Each step looked and tasted delicious. The filling thickened up beautifully. 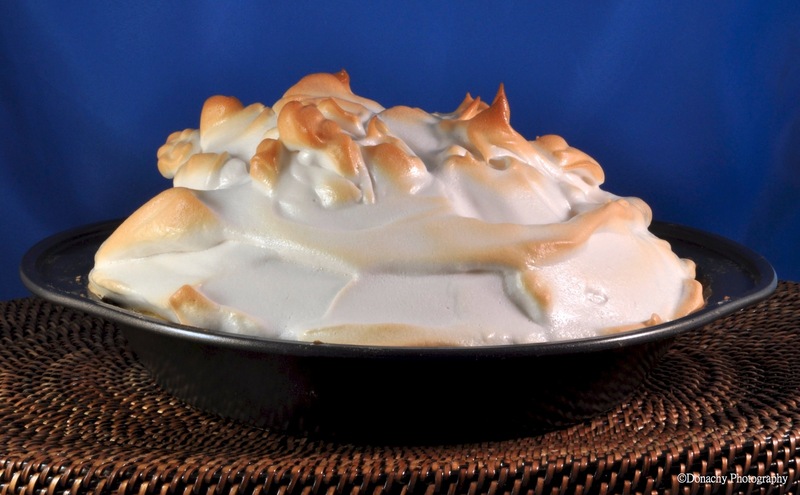 The meringue browned in just the right way. At the end of an Arctic-Mexican meal featuring enchiladas and Spanish-style rice, everyone agreed that the chocolate orange meringue pie was impressive to look at… and then it disappeared! For chocolate filling: In a medium pot, mix together 1 1/2 cups of granulated sugar, cocoa powder, flour and salt. Stir in egg yolks and milk. Stir in orange zest. Whisk until well blended. Cook over medium heat, stirring constantly. Cook until filling has the consistency of pudding, about 10 minutes. Turn heat off. Stir in vanilla and butter. Stir until both are incorporated. Pour filling into baked pie shell. Refrigerate to set for 4 hours or overnight. When you are ready to make the meringue, take the pie out of the refrigerator. For meringue: In a non-reactive bowl beat egg whites until foamy. Add cream of tartar. Continue beating eggs until soft peak stage (peaks will sag when you remove beaters). Add 1/4 cup sugar a tablespoon at a time, allowing sugar to dissolve between additions. Continue beating until stiff peaks form and egg whites are stiff and glossy. Spread the meringue over the pie completely. You can make decorative peaks by using a dull knife to shape the meringue. Place pie in oven on a low rack. Bake for 10 minutes until meringue is golden brown. Wonderful – that’s so pretty. Allowed? I think you are entitled! Like the way you two think! Yeeha! Wow, this looks delightful. Thank you! This really does look beautiful, a much more interesting take on a meringue pie than you usually see!